The Best Picture winner, co-producer/director/actor Kevin Costner's three-hour epic and revisionistic western film Dances With Wolves was an anomaly win in Oscar history - it was only the second time that a western genre film won the Best Picture Oscar. [The first Best Picture western film was Cimarron (1930-31), sixty years earlier.] However, some argued that Costner's (another actor-turned-director) romantic-epic film shouldn't have been categorized as a Western. 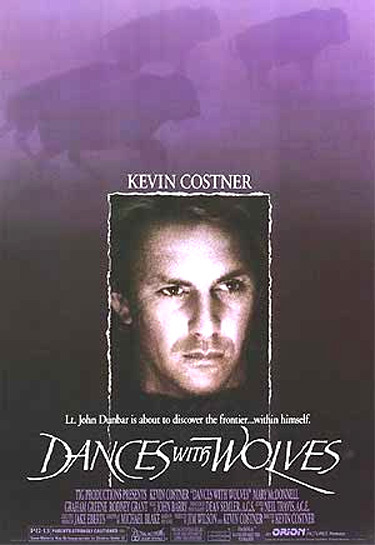 Dances With Wolves was honored with twelve nominations and seven Oscar wins - Best Picture (Costner), Best Director (for Costner's directorial debut film), Best Adapted Screenplay (Michael Blake), Best Cinematography (Dean Semler), Best Sound, Best Original Score (John Barry), and Best Film Editing. The pretentious, but visually-impressive film told the saga of a Civil War Union officer, Lt. John W. Dunbar, who became disillusioned, headed west, and eventually found peace away from white civilization with nature and the Lakota Sioux. The film contained long portions of the Sioux-Lakota language and detailed the native American culture. Its tagline was: "Lt. John Dunbar is about to discover the frontier...within himself." The two directors put into their slots for films without Best Picture nominations were Stephen Frears for The Grifters (with four nominations and no wins), a shocking film-noirish tale of three con artists - a film adaptation of Jim Thompson's hard-boiled novel, and director Barbet Schroeder for the dramatic Reversal of Fortune (with three nominations and one win - Best Actor), the story of Harvard law professor Alan Dershowitz's defense appeal of Claus Von Bulow's conviction for attempted murder of his wife. The Best Actor award was presented to Jeremy Irons (with his first nomination) for his performance in Reversal of Fortune as the icy, arrogant, and decadently-aristocratic millionaire Claus Von Bulow who was accused of trying to kill his comatose Newport heiress wife Sunny (Glenn Close). 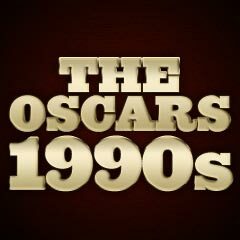 The Best Actress award was given to Kathy Bates (with her first nomination) as obsessed, psychopathic fan Annie Wilkes for a romance novelist (James Caan) in director Rob Reiner's black thriller Misery (the film's sole nomination), William Goldman's adaptation of Stephen King's novel. Never-nominated actress Myrna Loy received an Honorary Oscar this year, "in recognition of her extraordinary qualities both on screen and off, with appreciation for a lifetime's worth of indelible performances." She was best known for her appearance opposite William Powell in The Thin Man (1934) series of six films. Sophia Loren was also presented another Honorary Oscar - "one of the genuine treasures of world cinema who, in a career rich with memorable performances, has added permanent luster to our art form." She had been nominated as Best Actress for Marriage-Italian Style (1964), and won her only Best Actress Oscar for Two Women (1960). The biggest omission of the year was the Coen Brothers' neglected and fresh gangster film Miller's Crossing (see below for acting omissions) - with no Best Picture, cinematography, or screenplay nominations. In addition, actor/director Jack Nicholson's The Two Jakes, a sequel to Polanski's Chinatown (1974) was completely overlooked: Nicholson's dual roles, screenplay by Robert Towne, Vilmos Zsigmond's cinematography, and Harvey Keitel as the "other" Jake. And female director Penny Marshall was overlooked as a Best Director nominee, even though her film Awakenings was a Best Picture nominee. There was no recognition for the latex animatronic costumes (by Jim Henson Productions) for Teenage Mutant Ninja Turtles: The Movie, for Jim Henson's last-produced film - director Nicolas Roeg's - The Witches with Anjelica Huston, or for Michael Caton-Jones' story about a WWII B-17 bomber and its crew, Memphis Belle. Bruce Joel Rubin won the Best Original Screenplay Oscar for Ghost, but his co-scripted screenplay for Jacob's Ladder (with no nominations) was neglected. Stephen Frears' The Grifters contained marvelous performances and had four prominent nominations (Best Actress - Anjelica Huston, Best Supporting Actress - Annette Bening, Best Director, and Best Adapted Screenplay - Donald E Westlake), but ended up with no Oscars.